Our fourth and sixth grade students (minus the band members) walked to the local daycare center to sing to the kids. Here is the first public performance of our new ukulele club. We are playing Mele Kalikimaka at our annual Christmas program. The students have only been playing for a month and I am very pleased with their progress. If you are interested they are playing the Kala LU-21 soprano ukulele and I am playing a Boulder Creek spruce top tenor. 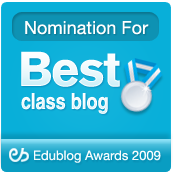 This is a site I have used with my class for several years. 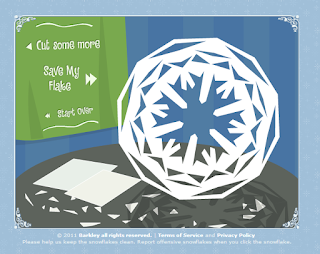 In fact, I used it to teach myself how to fold paper to create paper snowflakes. When you are finished your snowflake is set adrift throughout the digital world and you can watch them fall or even capture one from someone else. I hope you all have a great Holiday break! Elf Yourself is Now an App! I used to make these videos every year, and now it is much easier. With the Elf Yourself app you can take pictures and immediately insert them. I hope you enjoy the show! 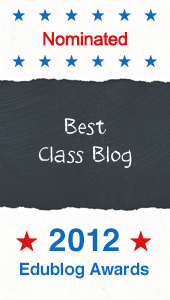 I am pleased to announce that our class blog has been chosen as a finalist for the 2012 Edublog Awards in the category Best Class Blog. 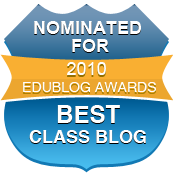 This is a great honor and the fourth year for being nominated for this award. 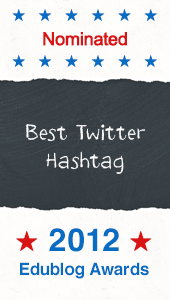 I am also really pleased to announce that the Twitter hash tag #Comments4Kids was nominated as Best Twitter Hashtag. 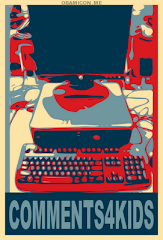 You can learn more about Comments4Kids on the Comments4Kids blog. If you would like to vote for these just click on the respective links above. 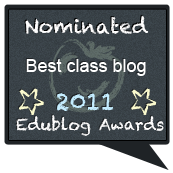 If you don't want to vote, I still suggest you go and check out the nominees. There are a lot of great people represented and you and I can learn a lot from them.